If you are having problems with one or more of your reinforcers, please follow these instructions to troubleshoot the issue. NOTE: Installation needs to be performed with administrative privileges on the computer. On home and personal computers, you will typically have administrative privileges. On school and institutional computers, you will typically need to have someone from your IT department perform the installation (or another person with administrative access to your computer). The DT Trainer has a wide range of reinforcers to motivate students. The wide range of reinforcers allow you to usually find reinforcers that will motivate most students – even ones that have very limited interests. Customers can also add their own reinforcers to increase the ability to address the needs of specific students. The flexibility of the reinforcement system is one of the features that make the program so powerful. The reinforcers use various multimedia engines, which need to be running properly on the system for the reinforcers to work. Fortunately, there are just a few multimedia engines, so only a few reinforcers will need to be tested to make sure the players are available for the hundreds of reinforcers that are selectable for use with students. The easiest way to test the few reinforcers is to start DT Trainer Administration, which should be located on your desktop. NOTE: We are assuming you are at least running version 2.5.3. When launching the DTT Administration, you may be prompted to check for updates. If installing older versions from CDs, you may need to first complete the updates (or purchase a Continuation Bundle and then update) to bring your software up to the current version. If your license has expired, contact sales@dttrainer.com for a quote to bring your license(s) up to date. Once you launch the DT Trainer Administration, select the “Student Administration” tab, then the “003 Yr Old Sample” student, and finally click the “Reinforcers” button indicated below. 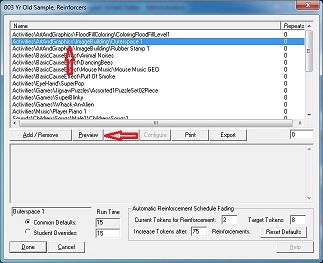 The next dialog shows the reinforcers selected for the student. Remember, testing just a few reinforcers from the “003 Yr Old Sample” student will ensure your media players are available no matter what reinforcers you select for your students. To test a reinforcer, simply click to select the reinforcer, then click the “Preview” button. You only need to test 3 players (Shockwave, Java, and a video player) and make sure the Visual C++ dlls are available. If the Shockwave version has not been used on the computer previously, it may try to complete installation on the first run of the reinforcer. In this case, you will see a spinning icon or some other message indicating it is downloading components. The reinforcer may time out before shockwave is completely setup. If it is trying to configure itself, please preview the reinforcer several times until the reinforcer launches and is ready to use in just one to a few seconds. If you see the following error, you are missing the Visual C++ dlls. Please contact the AES Support Team at support@dttrainer.com.